While you can't see it, there is a water source in the pile of rocks in the center of this picture. Like all desert animals how desert Bighorn sheep acquire and conserve water is literally a matter of life and death. Some animals like the kit fox and the jackrabbit can live off the water that they find in their food and the occasional rain. Desert Bighorn sheep cannot do this. They must have water to drink on a regular basis. In the extreme heat of the summer they will often drink once a day. In the wintertime they may go as long as two months without drinking water. In many of the desert Bighorn sheep habitats the number of Springs and other water sources determine the number sheep that can live there and the size of the habitat. Bighorn sheep can be fairly choosy about which water they use. If the situation around the water source favors the predators too much they will not use it. Another thing that stops Bighorn sheep is thick brush. They will not push their way through it to get a drink of water. Nor will they try to dig their way to water with their hoofs. When it comes to digging they will let the coyote do all the work. At many springs and water pockets you can see game trails where the sheep have been using the same access points for thousands of years. Desert Bighorn sheep have the ability to remember the whereabouts of the smallest spring or waterhole in their home range, even if they have not drank from it in many years. When barrel cactus are in the right condition, desert Bighorn sheep will break them open and eat the water rich pulp inside. This allows them to go weeks without going to water, even in hot weather. In order to conserve water desert Bighorn sheep will often seek out shade, but usually will not do this at the expense of safety. 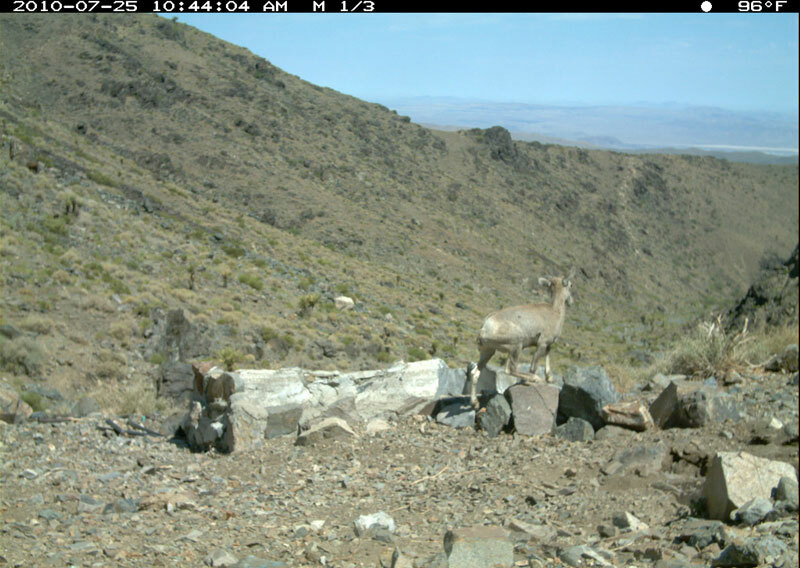 Once in a while a group desert Bighorn sheep will get to a water source and find it dry. When this happens they will set off to the next available water source, but sometimes they don’t all make it. Life in the desert is brutal and that’s just the way of things in the desert. If you look at the data bar on the top of this picture you'll see that only four minutes as a lapsed from my departure to the arrival of this Bighorn sheep Lamb. This young lamb was desperate for water and had left his mother and heard more than a quarter-mile away. This is a vivid reminder that we should always minimize our time at a desert water source. 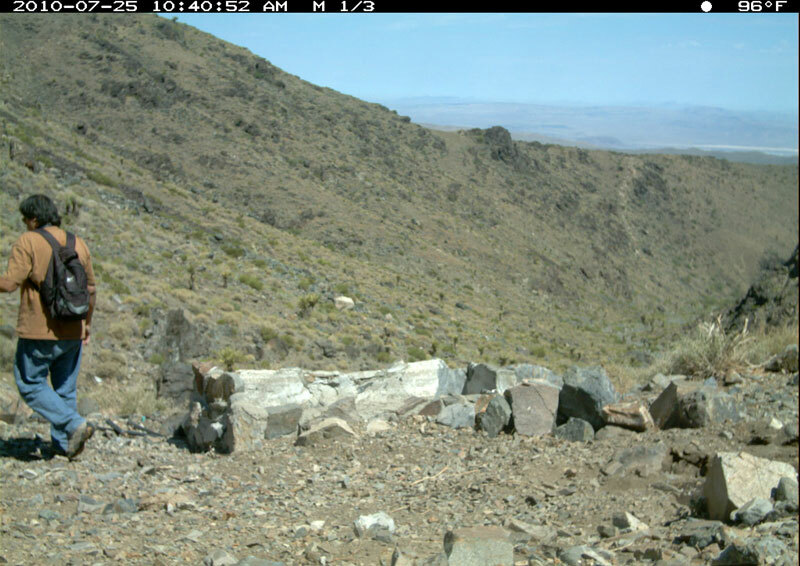 The reason for this series of articles is to give readers the tools and concepts to increase their knowledge of Bighorn Sheep and the value of their own personal experiences in the desert when they're in Bighorn habitat or have the good fortune to actually see some of these magnificent animals. It could be said that all Bighorns have horns but not all Bighorn have big horns. While this sounds a little bit confusing, basically it means that both male and female Bighorn sheep have horns. However their horns are quite different from one another in both size and structure. Tracking and reading sign is art form that can be applied to any species but here we are going to concentrating on the desert Bighorn sheep. This lecture presents two scenarios involving predator and prey. These scenarios depict how the reaction of one presents awareness by the other.